Holy Thursday or Maundy Thursday marks the Beginning of the Sacred Triduum (Holy Thursday, Good Friday and Holy Saturday) and is one of the most complex and profound of all religious observances. It celebrates the institution by Christ Himself of the Eucharist and of the institution of the priesthood for in this, His last supper with the disciples, a celebration of Passover, He is the self-offered Passover Victim, and every ordained priest to this day presents this same sacrifice, by Christ's authority and command, in exactly the same way. The Last Supper was also Christ's farewell to His assembled disciples, some of whom would betray, desert or deny Him before the sun rose again. On Holy Thursday morning there is a special Mass in Cathedral Churches, celebrated by the bishop and as many priests of the diocese as can attend, because it is a solemn observance of Christ's institution of the priesthood at the Last Supper. At this "Chrism Mass" the bishop also blesses the Oil of Chrism used for Baptism, Confirmation and Anointing of the sick or dying. The bishop may wash the feet of twelve of the priests, to symbolize Christ's washing the feet of His Apostles, the first priests. The evening Holy Thursday Liturgy, marks the end of Lent and the beginning of the sacred "Triduum" ("three days") of Holy Week, which culminates in the Easter Vigil, and concludes at Vespers on the evening of Easter day. The Mass begins in the evening, because Passover began at sundown; it commemorates Our Lord's institution of the Holy Eucharist at the Last Supper. 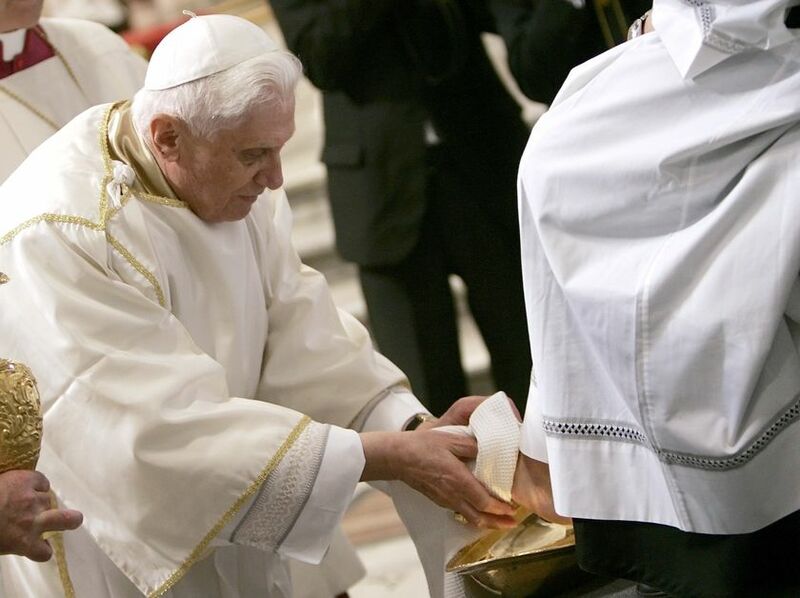 It also shows both the worth God ascribes to the humility of service, and the need for cleansing with water (a symbol of baptism) in the Mandatum, washing, commemorating Jesus' washing the feet of His apostles, as well as in the priest's stripping and washing of the altar. Cleansing, in fact, gave this day of Holy Week the name Maundy Thursday. The action of the Church on this night also witnesses to the Church's esteem for Christ's Body present in the consecrated Host in the Adoration of the Blessed Sacrament, carried in solemn procession to the flower-bedecked Altar of Repose, where it will remain "entombed" until the communion service on Good Friday. No Mass will be celebrated again in the Church until the Easter Vigil proclaims the Resurrection. Ø The agony and capture of Jesus in the Garden of Olives.